Will our RED boat become YOUR RED boat? RED is a steel hull, blue water, cruising sailboat designed and built by Ed Rutherford, Waterline Yachts. After six years in the South Pacific RED is back in the Pacific Northwest ready to begin the Coconut Milk-run all over again. RED was thoughtfully designed for cruising and is beautifully laid out for entertaining at anchor. Coming down the companionway to port is the large kitchen, on starboard, the comfortable nav station. It’s all bright and open. The dinette is raised, with incredible visibility forward and on each side. The interior is white with maple accents. The forward berth is queen size with hanging closet and cavernous storage below bed (2 openable hatches). The quarter-berth (aft starboard) has plenty of headroom and is very comfortable for guests, or on passage (4 openable ports). The port aft houses the shop. RED sails wonderfully, is comfortable, bright and roomy, and is fully equipped with many (many) spares. The Yanmar Diesel (88hp) has excellent access, there’s a shop for projects, a 30 gph watermaker, full electronics, is rod rigged, the prop is an Autoprop. 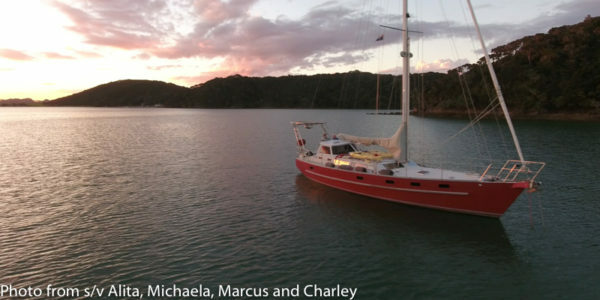 RED has many cruising amenities including a hard dodger, autopilot (with installed backup), solar, recessed anchor well with two oversize anchors and washdown (salt & fresh). Enjoy the photos below and send an email if you’d like RED to be yours!